Cat's Best Green Power is an efficient, completely natural clumping cat litter free from artificial or chemical additives. The cat litter is made from 100% renewable, untreated plant fibres, meaning that it is both compostable and 100% biodegradable. The extra fine grains are also especially gentle on your cat's paws. 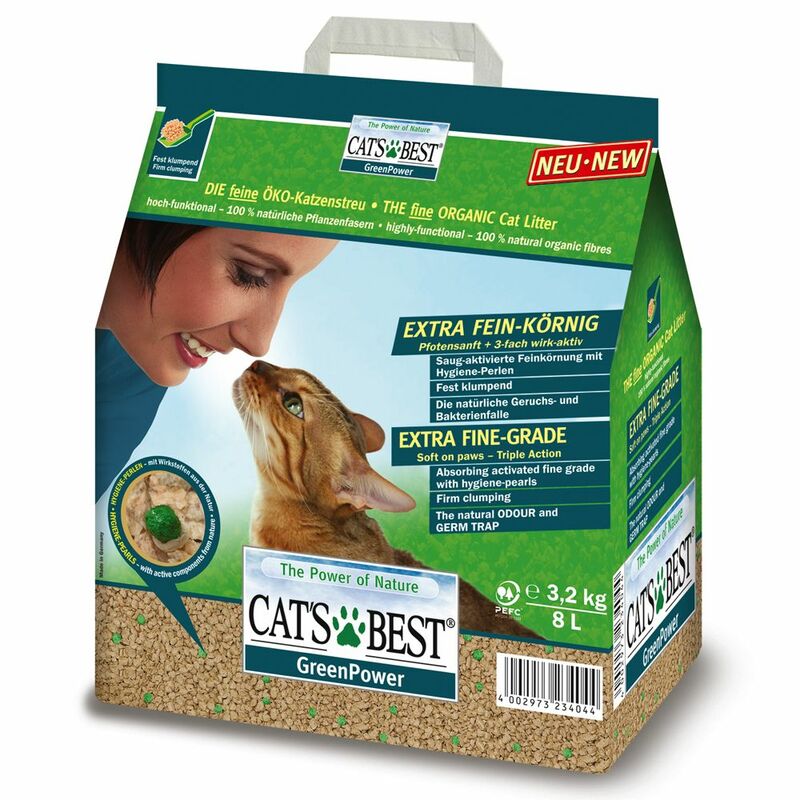 Cat's Best Green Power clumping cat litter contains green, organic hygiene pearls, which function as a natural odour blocker to stop unpleasant smells from developing. The unique JRS-OrganicFibre800-Technology also absorbs moisture and nasty odours into the fibre's core, trapping bacteria and odours for long-term freshneΒ. Thanks to the highly efficient capillary action, this cat litter is capable of up to 800% moisture absorption compared to its original volume. Cat's Best Green Power forms extra compact clumps, making it easy to remove any soiled litter from your cat's litter tray, while the bottom layer of litter can be left for up to 8 weeks. This means that Cat's Best Green Power cat litter is also very economical in use. Plus, for even more convenience, any waste clumps can be disposed of in the household toilet. The wood fibres used to produce Cat's Best Green Power clumping cat litter are sourced from domestic fir and spruce trees in sustainable forests. This is an environmentally-friendly, PEFC-certified product that also supports the natural biological cycle, from plant seedling to biologically decomposed product. Cat's Best Green Power at a glance: Highly efficient, completely natural clumping cat litter With green plant-based hygiene pearls: natural odour blockers that stop bad odours before they even develop JRS-OrganicFibre800-Technology: fibres absorb moisture and nasty odours, trapping bacteria and odours for long-term freshneΒ Extra fine granules: gentle on your cat's paws, making it ideal for cats that demand high levels of comfort Up to 800% moisture absorption: efficient capillary action for dry paws and optimal liquid binding Forms extra compact clumps: soiled litter is easy to remove without meΒy crumbling Very economical: bottom layer of litter can be left for up to 8 weeks Completely natural product: compostable and 100% biodegradable cat litter made from the finest untreated, renewable plant fibres, with no artificial or chemical additives PEFC-certified: with wood fibres sourced from domestic fir and spruce trees in sustainable forests Disposable in the household toilet: made from natural plant fibres, which diΒolve in water just like toilet paper, preventing pipe blockages and problems with sewage treatment – please flush using plenty of water Environmentally friendly: supports the natural biological cycle.